Pre-heat the oven to 180°C/375°F (convection heat). Meanwhile, wash and dry the cherry tomatoes, then halve them. Slice the goat cheese. Purée the dried tomatoes, tomato purée, garlic clove, olive oil, and some of the thyme in a blender. Mix in maple syrup and salt and pepper to taste. Halve the rectangular puff pastry sheets to form squares. With a sharp knife, score each pastry square with a line on each side approx. 1 cm/0.5 in. from the edge. Whisk the egg yolk and lightly brush the edges of the puff pastry with it. Place a spoonful of tomato paste mixture onto each piece of pastry and spread it to the edges. 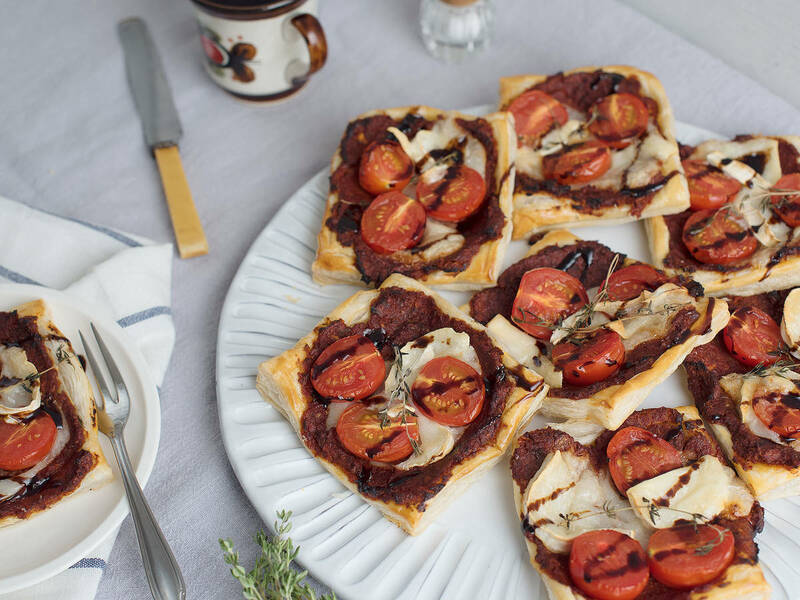 Arrange goat cheese and tomatoes on each tart and garnish with a sprig of thyme. Transfer tartlets to baking sheet. Bake the tarts at 180°C/350°F for approx. 20 min. until golden brown. Remove from the oven and drizzle with balsamic glaze. Enjoy!